Offering integration and scalability, the new, high efficiency Integrated Control Systems from Hurst Boiler for boiler room monitoring and communications provide advanced supervisory boiler controls for all new and legacy Hurst products. Integration of equipment and IT systems and has become essential for efficient operation of facilities of all sizes. Hurst developed and offers a full line of processor based smart controls fully compatible with all Hurst designs including alternative fuel models, including existing boiler upgrade and retrofit options for this new technology. Precise control of fuel and combustion air can result in very high efficiencies for boilers. 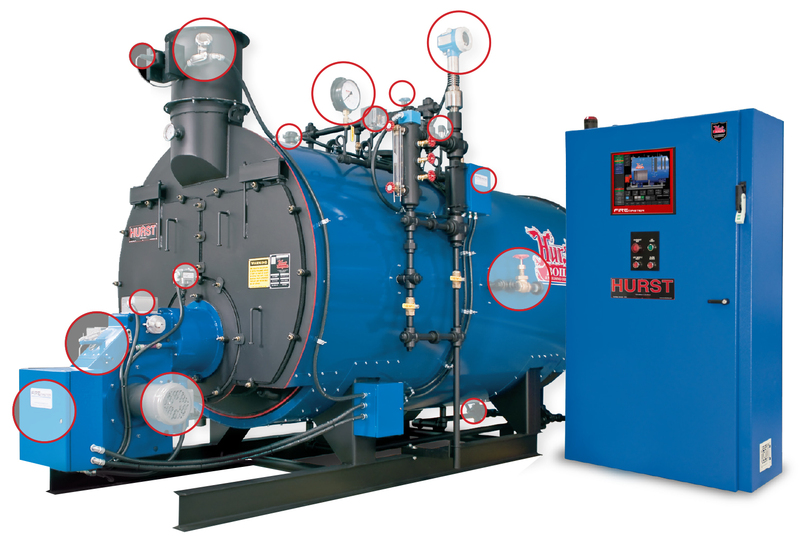 Hurst intelligent control systems allow you to harness these savings while increasing overall boiler plant productivity. FireMaster is an on-board automated monitoring control system designed for the optimal control and operation of a single boiler/burner package. BoilerMaster brings up to four of your boilers and equipment to a single collection control point. Now it is possible to monitor and manage your steam and hot water operations on-site from a user-friendly color touch screen, or remotely from off-site via secure internet by either computer or smartphone, or through a (SCADA) building automation system. Not able to be at the boiler room? Use the convenience of your office Ethernet network or the world wide web from anywhere, including from your smartphone, to access AND control the Firemaster system. Real-time data of efficiency and operating conditions are reported on a continual basis, and this information is archived daily into to the system’s history log and retrievable at any time. Utilizing the FireMaster’s array of options to suit your personalized boiler system enables the full power of the processor’s ability to manage and optimize over all efficiencies. FireMaster is fuel flexible- Burn gas and/or oil, with automated fuel changeover to maintain constant header pressure. Implemented Lead-Lag allows each boiler in the system to work simultaneously to maintain constant load pressure. Average target output range accommodates 300-2,500 HP. Surge tanks in this system support between 500-1,000 gallons. Guaranteed efficiency of 80%, FireMaster can reach 85%+ efficiency with optional Economizer. On-screen fuel management system includes steam flow totalization and real-time calculated efficiency. Huge user-friendly Siemens 19" display- Simple to learn operator touchscreen interface, each interactive screen is designed for intuitive visual understanding with precise control. FireMaster uses LAN integrated Siemens S7-1200 series PLCs for process control. FireMaster uses Fireye servos for their finer degree of actuation, built in Modbus communication, and internal diagnostic reporting. Blowers are controlled by Siemens G120 VFDs for greater efficiency. FSG is Honeywell 7800 series (SCC LMV3 option available). FireMaster is designed to easily integrate with existing TCP communicating SCADA and data acquisition systems. Over 40 industrial protocols supported including BACnet, Modbus, EtherNet/IP, and more. Communication to Allen-Bradley/ Rockwell systems supported. FireMaster includes internet based remote tech support via a hardware VPN. Touch screen includes multi-language option. (Option) Cell modem for internet. (Option) Allen Bradley components available upon request. (Option) Native user defined data logging to LAN or internet accessible CSV files.